Victor Chipani started working when he was 10 years old  a few hours each day, rounding up passengers to fill public minibuses in his impoverished city of El Alto, Bolivia, outside the capital, La Paz. Now, at 15, he does the job from 7 a.m. to 7 p.m., Monday through Friday, earning less than a dollar an hour. His meager wage helps feed his eight siblings and covers his supplies for night school. But the small-framed teenager, who hopes to attend college and even medical school, doesn't want anyone's pity. He can defend himself, he insists  through his union. "United," he says, sounding like a seasoned adult laborite, "we as child workers can achieve anything." Child labor, as it should be, is an urgent issue for any country at any level of development. Several states across the U.S., in fact, are wrestling with corporate-backed proposals to loosen child-labor laws in a downturn economy. But Chipani is part of a different movement rippling across Latin America. In countries like Bolivia, more than 100,000 children and teenagers have organized unions to defend their right to work, demanding government protection and improved job conditions. "We'd all like a world where kids don't have to work," says 17-year-old Noemí Gutiérrez, a leader of Bolivia's Union of Child and Adolescent Workers, or UNATSBO, which represents Chipani and 15,000 others ages 8 to 18. "But our current economic reality means we work to help our families, and our rights ought to be protected." Globally, according to the Switzerland-based International Labour Organization (ILO), there are currently more than 215 million workers between the ages of 5 and 17, 14 million of them in Latin America. They dot agricultural fields, weave through city markets and shimmy down mine shafts. 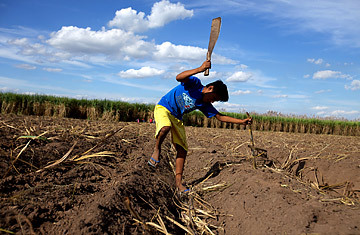 More than 150 nations, backed by millions of dollars from the U.N. Children's Fund, have adopted the ILO's landmark conventions, establishing legal minimum working ages (normally 14 or 15) and promising to abolish the "worst forms" of child labor. As a result, millions of children no longer endanger their lives every day for a pittance. But, say UNATSBO and its partner unions, there's a problem. Much like undocumented immigrants in the U.S., the hundreds of millions of children still left working exist in a legal void that makes them the world's most vulnerable labor force. In Bolivia, South America's poorest nation, there are as many as a million child workers  the highest rate, proportional to population, on the continent. The vast majority are not frightened and abused waifs; rather, most spend a few hours a day tending crops, shining shoes, wheeling loads through markets or assisting in carpentry shops. Most also attend school. And someone, they insist, has to look out and stand up for them. "People pay us less because we are young," says 16-year-old UNATSBO president José Guillermo Mamani. "We are discriminated against, and no one is held accountable [for that]." Governments like Bolivia's counter that legislating the child-labor sector would essentially mean condoning and legitimizing it. "We are not going to go in that direction," says Mabel Duran, who heads the federal Office for Child Labor Eradication, adding that the government will not consider lowering the acceptable working age. "We are honoring our international commitments." Guilds like UNATSBO, then, say they have to play the necessary role the government won't touch. The first such child-worker organization was founded in Peru 35 years ago; today there are eight in Latin America (in Bolivia, Peru, Ecuador, Venezuela, Guatemala, Colombia, Paraguay and Nicaragua). They receive financial support from small child-advocacy NGOs, often with adult social workers as advisers. All require their members to stay in school and establish projects to improve working conditions. In Ecuador, the union has organized a system of cooperatives that provides better-paying jobs for children and teens. Venezuela's guild has forged pacts in which buyers purchase agricultural products farmed by kids at fair prices. In Bolivia, newspaper boys even held a strike to increase their pay. See photos of the child tobacco farmers of Kazakhstan.